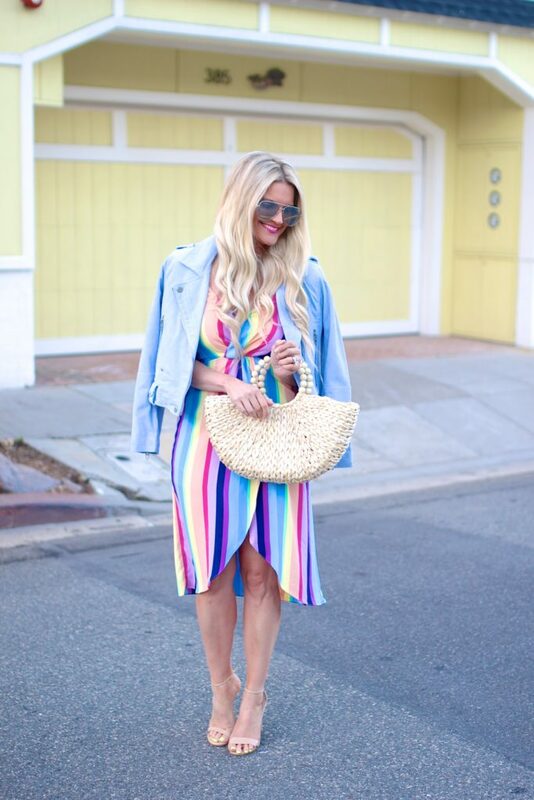 If you’ve been on Instagram, shopped in stores or online lately, you’ve seen that rainbow patterned items are taking the fashion world by storm! And you know me – I’m always down for a good dose of color…especially on a Monday! The vibrant shades of purple, blue, peach, mauve, yellow and mint made this dress so playful & fun! Hope you guys had a great weekend! I’m just back from Palm Springs with one of my sisters, and it was a fun trip! Nothing better than a little sister time with unlimited margaritas, right? I actually have a rainbow print dress on my wish list right now even though I usually never go for the colorful pieces. 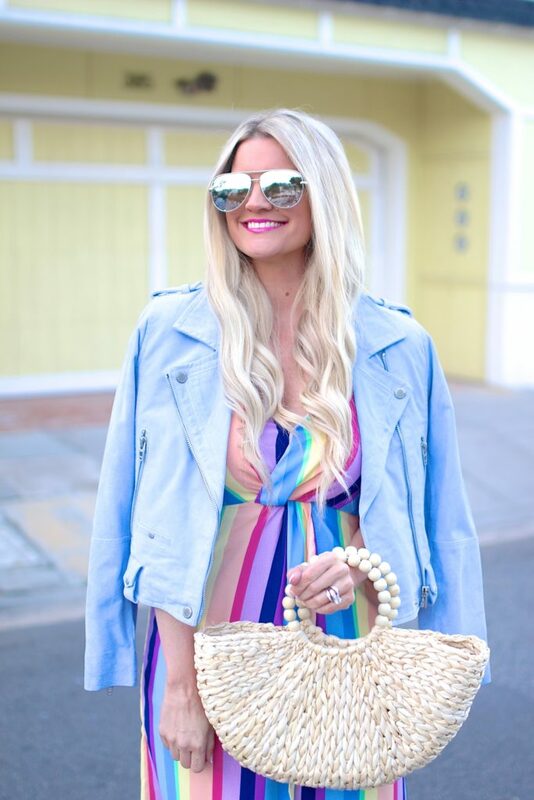 This dress looks so good on you and that jacket is just the prettiest periwinkle! Your bag is so cute!!! Love the details. I need to get on the rainbow wagon. Love that dress so much and the lovely baby blue moto jacket. Also, that trip sounds amazing! Such a cute dress! Love all the colors! Unlimited margarita’s and sister time sounds like the perfect weekend! I’m loving the rainbow trend and that dress is gorgeous on you! 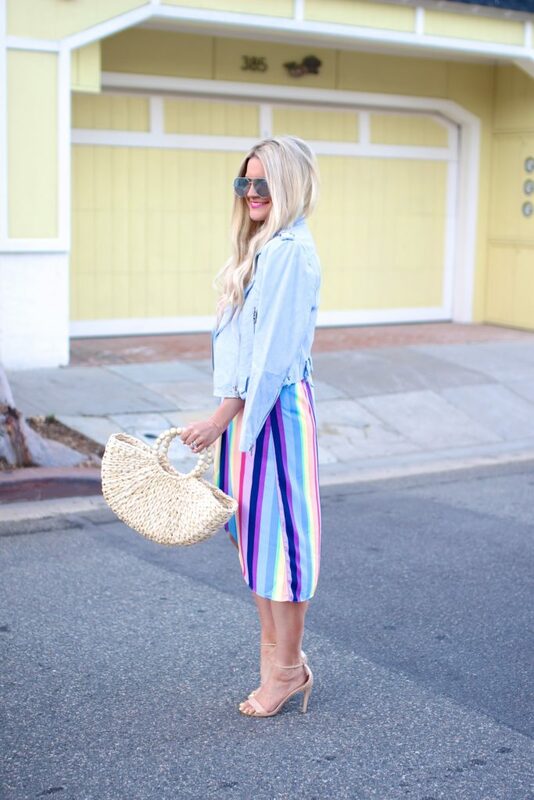 A rainbow stripe feels like the perfect way to celebrate spring- loving this, doll! Loving the rainbow vibe. Amazing. You look great. Such a beautiful dress! Love the colors of the rainbow. I will have to keep my eye out for more rainbow pieces! such a fun dress! super cute spring outfit! Such a pretty and dreamy looking dress! How you paired it with a denim jacket is perfect. Your post title made me think of Kermit (the frog) singing. What a fun dress! I am loving the rainbow trend this season! It’s so much fun and of course full of all the colors I love! So adorable! I love, the colors and the vertical stripes. You do rainbow the best! I have seen a lot of rainbow fashion. Each piece is unique and pretty. I love the dress and how you styled it. Love me some rainbow stripes! Bring on the color! This dress is so gorgeous I love the colors and that slight knot in front. You KNOW I am loving the rainbow trend!! This dress is so fabulous and I love how you styled it. Have a wonderful weekend, gorgeous! !